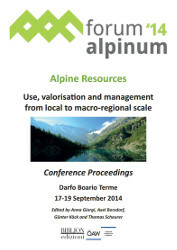 Now in its eleventh edition, ForumAlpinum 2014, a biennial international scientific conference, focused its debate on the use, development and management of Alpine resources at local and macro-regional levels. The background to the discussion was the creation of a macro-regional strategy that meets the challenge of the future management of such resources. ForumAlpinum 2014 provided a platform for dialogue between the worlds of politics and science through the participation of policy-makers from the Alpine Countries and regions, who debated prospects for the integration of policies relating to Alpine resources.